The manufacturers’ deduction, also called the “Section 199” or “domestic production activities” deduction, is available to traditional manufacturers. But businesses engaged in activities such as construction, engineering, architecture, computer software production and agricultural processing also may be eligible. The deduction is 9% of the lesser of qualified production activities income or taxable income. The deduction is also limited to 50% of W-2 wages paid by the taxpayer that are allocable to domestic production gross receipts. To learn whether this potentially powerful deduction could reduce your business’s tax liability when you file your 2014 return call your Frazer LLP tax advisor in Brea, 714.990.1040, or Visalia, 559.732.4135. You probably know that miles driven for business purposes can be deductible. But did you know that you might also be able to deduct miles driven for other purposes? For the 2015 mileage rates and the rules surrounding the various mileage deductions click here. Tax planning is more complicated yet more important than ever. To save the most, you need to understand how recent tax legislation affects you and take advantage of every tax break you're entitled to. This is exactly what our online Tax Planning Guide is designed to help you do. As you look through the guide, please note the strategies and tax law provisions that apply to your situation or that you wold like to know more about. 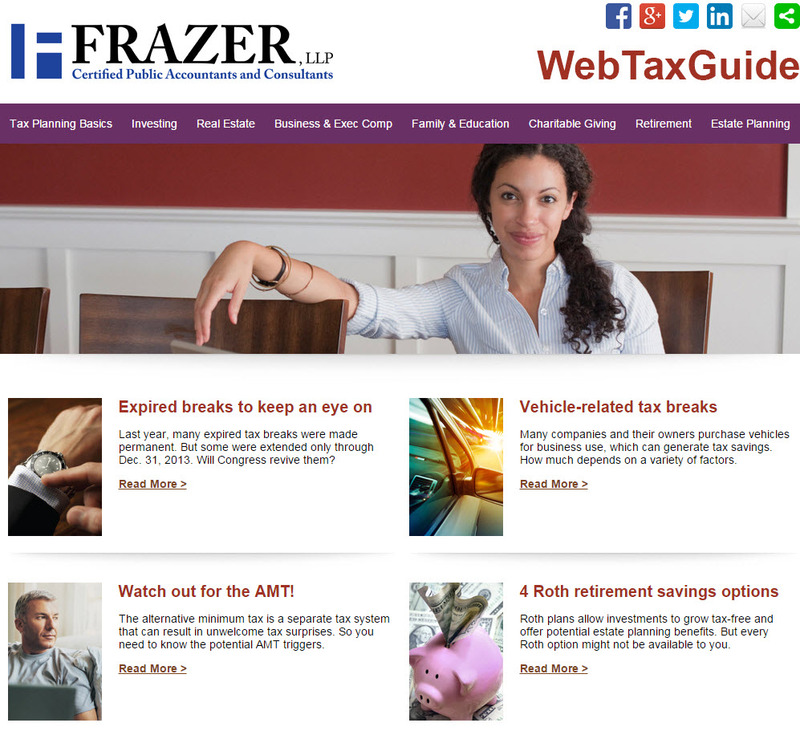 Then, call your Frazer LLP tax advisor - or click the button below - with any questions you may have about these or other tax matters or to schedule a time to talk about ways to lighten your tax burden and better achieve your financial objectives.